The transition metal-catalyzed [2+2+2] cycloaddition of three unsaturated partners is one of the most powerful reactions for access to aromatic, heteroaromatic, and polycyclic compounds. Recently, we report new approaches to the well-known [2+2+2] cycloaddition using the promising reactivity of the [Co(PMe3)4(R)] family of cobalt catalysts or mild niobium catalyst. Some asymmetric versions of these reactions have been also explored. Ventre, S. ; Simon, C. ; Rekhroukh, F. ; Malacria, M. ; Amatore, M. ; Aubert, C. ; Petit, M. Chem. Eur. J. 2013, 19, 5830–5835. Although their catalytic efficiency is well established, the cobalt complexes of the [Co(Cp)(L)2] type suffer from several drawbacks (drastic activation or low temperatures, stoichiometric processes). The use of [Co(H)(PMe3)4] as a cobalt catalyst allows the previously unattainable catalytic version of the cobalt-mediated cycloaddition of enediynes without the requirement of thermal or light activation. The importance of a chelating group on the substrate that can selectively direct the reaction pathway toward the classical polycyclic 1,3-cyclohexadienes or a new family of bicyclic trienes is also demonstrated. Mild niobium-catalyzed [2+2+2] cycloaddition of sila-triynes : easy access to polysubstituted benzosilacyclobutenes Simon, C. ; Amatore, M. ; Aubert, C. ; Petit, M. Org. Lett. 2015, DOI : 10.1021/ol503663k. A new and efficient synthesis of highly sensitive benzosilacyclobutenes has been developed. For the first time, these compounds can be synthesized in very high yields by a mild, unprecedented intramolecular niobium-catalyzed [2+2+2] cycloaddition of easily accessible tetrasubstituted sila-triynes. An easy access of highly functionalized enlarging the number of potential applications in organic and material chemistry is described. Amatore, M. ; Lebœuf, D. ; Malacria, M. ; Gandon, V. ; Aubert, C. J. Am. Chem. Soc. 2013, 135, 4576–4579. A new asymmetric [2+2+2] cycloaddition of diynes to sulfonimines under rhodium catalysis is described, providing the corresponding enantioenriched 1,2-dihydropyridines in good yields. Besides their unprecedented reactivity towards [2+2+2] cycloaddition reactions, cobalt catalysts are also capable of promoting new activation modes of C–H bonds. However, these-cobalt-mediated direct C–H functionalization reactions often suffer limitations, mainly regarding mechanistic insight. Interestingly, the simple and well-defined cobalt catalysts of the [Co(PMe3)4(R)] family allow us to address some of these issues as the precise nature of the catalytic species is known and no additives are required. Hydrido-cobalt catalyst as a selective tool for the dimerisation of acetylenes : scope and theoritical studies Ventre, S. ; Derat, E. ; Amatore, M. ; Aubert, C. ; Petit, M. Adv. Synth. Catal. 2013, 355, 2584–2590. A simple hydrido-cobalt complex efficiently catalyses the highly regio- and stereoselective dimerisation of various terminal arylacetylenes under mild conditions. The corresponding (E)-1,4-enynes are obtained as sole isomers with good to excellent yields. DFT calculations revealed that the reaction proceeds via a C–H activation/hydrocobaltation pathway. C–H activation/functionalization catalyzed by simple, well-defined low-valent cobalt complexes Fallon, B. J. ; Derat, E. ; Amatore, M. ; Aubert, C. ; Chemla, F. ; Ferreira, F. ; Perez-Luna, A. ; Petit, M. J. Am. Chem. Soc. 2015, DOI : 10.1021/ja512728f. A facile C–H activation and functionalization of aromatic imines is presented using low-valent cobalt catalysts. Using Co(PMe3)4 as catalyst we have developed an efficient and simple protocol for the C–H/hydroarylation of alkynes with an anti selectivity. Deuterium-labeling experoments, DFT calculations coupled with the use of a well-defined catalyst have for the first time shed light on the elusive black box of cobalt-catalyzed C–H functionalization. Sandwich cobalt complexes of the type [(η4-C4R4)Co(η5-C5R5)] (also referred to as CpCoCb) are useful frameworks and building blocks for many applications in the field of organic devices such as photovoltaic solar cells. These complexes are often air-stable, easy to purify and thin solid films of these substituted CpCoCb’s represent efficient p-type semiconductors leading to high performance organic solar cells. An improved protocol for the synthesis of [(η4-C4R4)Co(η5-C5R5)] complexes Bertrand, G. ; Tortech, L. ; Fichou, D. ; Malacria, M. ; Aubert, C. ; Gandon, V. Chem. Commun. 2012, 31, 126–132. The reaction of bulky alynes C2R2 with (η5-C5R5)Co(CO)(dimethylfumarate) under microwave irradiation provides complexes of the type [(η4-C4R4)Co(η5-C5R5)] in good to excellent yields. This protocol represents a significant improvement over those reported previously. In particular, the formation of insertion products such as cyclopentadienones or cyclohexadienes can be avoided. In addition, because of the exceptional stability of (η5-C5R5)Co(CO)(dimethylfumarate), the reactions can be carried out in crude solvents. The easy access to [(η4-C4R4)Co(η5-C5R5)] complexes stimulated a study of their reactivity, notably under cross-coupling conditions. Synthesis and photovoltaic performances in solution-processed BHJs of oligothiophene-substituted organocobalt complexes [(η4-C4R4)Co(η5-C5R5)] Bertrand, G. ; Tortech, L. ; Gandon, V. ; Aubert, C. ; Fichou, D. Organometallics 2014, 50, 8663–8666. An efficient synthetic route toward novel organocobalt complexes [(η4-C4(nT)4)Co(η5-C5R5)] with n = 1, 2, 3 thiophene rings is described. Solutions-processed bulk heterojunctions solar cells based on CpCoCb(3T)4:PCBM blends achieve power conversion efficiencies of up to 2.1%. Molecular Complexity from Polyunsaturated Substrates. The Gold Catalysis Approach Fensterbank, L. ; Malacria, M. Acc. Chem. Res. 2014, 47, 953-965. When NHC Ligands Make a Difference in Gold Catalysis Gatineau, D. ; Goddard, J.-P. ; Mouriès-Mansuy, V. ; Fensterbank, L. Israel Journal of Chemistry 2013, 53, 892-900. The use of carbene gold complexes has resulted in improving a series of existing reactions, in altering some reactivity modes and also by leading to highly asymmetric processes. These three items are discussed on the basis of selected examples. Axet, M. R. ; Barbazanges, M. ; Augé, M. ; Desmarets, C. ; Moussa, J. ; Ollivier, C. ; Aubert, C. ; Fensterbank, L. ; Gandon, V. ; Malacria, M. ; Chamoreau, L.-M. ; Amouri, H., Organometallics 2010, 29, 6636–6638. In collaboration with the group of Hani Amouri, a novel type of metalated phosphino ligands, [Cp*Ru-(η6-arene-PPh2)][OTf], has been prepared in which the –PPh2 unit is attached to a metalated π-arene platform. Preliminary studies on the corresponding gold complexe 1 suggest that cationic complex is active in metal-catalyzed cycloisomerization reactions. Dubarle-Offner, J. ; Barbazanges, M. ; Augé, M. ; Desmarets, C. ; Moussa, J. ; Axet, M. R. ; Ollivier, C. ; Aubert, C. ; Fensterbank, L. ; Gandon, V. ; Malacria, M. ; Gontard, G. ; Amouri, H., Organometallics 2013, 32, 1665. A novel series of π-complexes of phosphino-ligands [Cp*Ru(η6-arene-PAr2)][OTf] has been prepared in which the diarylphosphine unit is attached to a metallated π-arene scaffold. Comparative study of the corresponding gold metal complexes with [Cp*Ru(η6-C6H5-PPh2-Au-Cl)][OTf] 1 revealed important information about the electronic nature of the gold center when bonded to a –PPh2 , –Pp-tol2 or –P(p-C6H4CF3)2 metallo-ligand. Several complexes of the family with electron-donating and withdrawing groups were evaluated towards cycloisomerization reactions of a classical N-tethered 1,6-enyne. Guitet, M. ; Zhang, P. ; Marcelo, F. ; Tugny, C. ; Jiménez-Barbero, J. ; Buriez, O. ; Amatore, C. ; Mouriès-Mansuy, V. ; Goddard, J.-P. ; Fensterbank, L. ; Zhang, Y. ; Roland, S. ; Ménand, M. ; Sollogoub, M. Angew. Chem. Int. Ed. 2013, 52, 7213. In the context of a collaboration with the group of Matthieu Sollogoub, head of the Glycochimie Organique biologique and supramoléculaire team at IPCM, we evaluated the catalytic properties of new α or β NHC-cyclodextrin(CD)-gold(I) catalysts in cycloisomerization reactions. To our delight, we observed an effect of the cavity on the outcome of the reaction both on selectivity and enantioselectivity. Schröder, F. ; Tugny, C. ; Salanouve, E. ; Clavier, H. ; Giordano, L. ; Moraleda, D. Gimbert, Y. ; Mouriès-Mansuy, V. ; Goddard, J.-P. ; Fensterbank, L. Organometallics 2014, 33, 4051. In collaboration with the Giordano-Moraleda-Clavier group in Marseille, a series of new secondary phosphine oxide (SPO) gold(I) complexes have been synthesized and characterized by X-ray crystallography. Complexes exhibited dimeric structures interconnected by O-H•••Cl hydrogen bonds. Their preliminary use in homogeneous catalysis is reported and suggests a broad field of application in prototypical enyne cycloisomerization and hydroxy-and methoxycyclization reactions. Combination of Gold Catalysis and Selectfluor for the Synthesis of Fluorinated Nitrogen Heterocycles Simonneau, A. ; Garcia, P. ; Goddard, J.-P. ; Mouriès-Mansuy, V. ; Malacria, M. ; Fensterbank, L. Beilstein J. Org. Chem. 2011, 7, 1379-1386. We herein report the synthesis of 3-fluoro-2-methylene-pyrrolidine and –piperidine, respectively from 1,5- and 1,6-aminoalkynes, based on a combination of a gold-catalyzed hydroamination reaction followed by electrophilic trapping of an intermediate cyclic enamine by Selectfluor. Careful attention was brought to the elucidation of the mechanism and Selectfluor was suggested to play the double role of the oxidation of gold(I) to a gold(III) active species and the electrophilic fluorination of the enamine intermediates. Simonneau, A. ; Harrak, Y. ; Jeanne-Julien, L. ; Lemière, G. ; Mouriès-Mansuy, V. ; Goddard, J.-P. ; Malacria, M. and Fensterbank, L. ChemCatChem 2013, 5, 1096. O-tethered 1,6-enynes incorporating a strained ring at the 3 position can cycloisomerize upon cationic gold(I) catalysis through a process involving a ring expansion. Fused tricycles containg a substituted tetrahydropyran are obtained in good yields. We also developed a two-step synthetic sequence allowing the transformation of the cyclized products into ketomacrolactones present in several natural products. Ferrand, F. ; Das Neves, N. ; Malacria, M. ; Mouriès-Mansuy, V. ; Ollivier, C. ; Fensterbank, L. J. Organomet. Chem. 2015, 10.1016/j.jorganchem.2015.02.003. Abstract. The gold-catalyzed cycloisomerization of tetrasubstituted -cumulenols has been investigated. Overall, two main pathways are followed. In the presence of a gold(III) catalyst, a dehydration process prevails giving diastereomerically pure dienynes while gold(I) catalysts favor the cycloisomerization to provide trisubstituted furan derivatives. Nzulu, F. ; Bontemps, A. ; Robert, J. ; Barbazanges, M. ; Fensterbank, L. ; Goddard, J.-P. ; Malacria, M. ; Ollivier, C. ; Petit, M. ; Rieger, J. ; Stoffelbach, F., Macromolecules 2014, 47, 6652–6656. The first polymerization exploiting the carbenic reactivity of homogeneous gold catalysis has been devised. 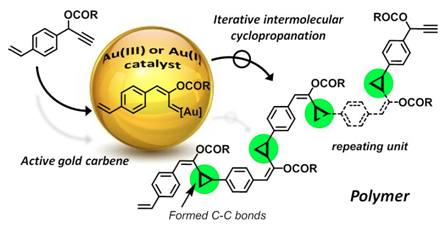 In the presence of a gold catalyst, monomers incorporating both a propargylic ester and an alkene moiety polymerized through a metallocarbene generation/cyclopropanation sequence to afford the corresponding macromolecules. This approach constitutes an unprecedented example of cyclopropanationbased polymerization and allows access to original macromolecule skeletons. Augé, M. ; Barbazanges, M. ; Tran, A. T. ; Simonneau, A. ; Elley, P. ; Amouri, H. ; Aubert, C. ; Fensterbank, L. ; Gandon, V. ; Malacria, M. ; Moussa, J. ; Ollivier, C., Chem. Commun. 2013, 49, 7833–7835. Highlight : Synfacts 2013, 9, 1311. Enantioselective cationic Rh(I)-catalyzed [2+2+2] cycloaddition reactions between diynes and isocyanates relying on the chiral anion strategy have been devised. In the presence of [Rh(cod)Cl]2, 1,4-bis(diphenylphosphino)butane, and the silver phosphate salt Ag(S)–TRIP as the unique source of chirality, axially chiral pyridones were isolated with ees up to 82%. This approach is novel in the field of chiral anion-mediated asymmetric catalysis since atroposelective transformations have so far remained unprecedented. It also proves to be complementary to the classical strategy based on chiral L-type ligands. Barbazanges, M. ; Augé, M. ; Moussa, J. ; Amouri, H. ; Aubert, C. ; Desmarets, C. ; Fensterbank, L. ; Gandon, V. ; Malacria, M. ; Ollivier, C., Chem. Eur. J. 2011, 17, 13789-13794. Enantioenriched bicyclo-[4.1.0]hept-2-enes were synthesized by IrI-catalyzed carbocyclization of 1,6-enynes. No chiral ligands were used, CO and PPh3 were the only ligands bound to iridium. 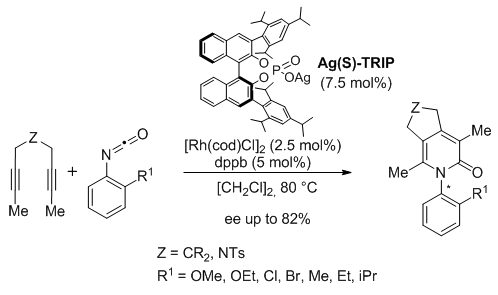 Instead, the stereochemical information was localized on the counterion of the catalyst, generated in situ by reaction of Vaskas complex (trans-[IrCl(CO)(PPh3)2]) with a chiral silver phosphate Ag(S)–TRIP. Enantiomeric excesses up to 93% were obtained when this catalytic mixture was used. 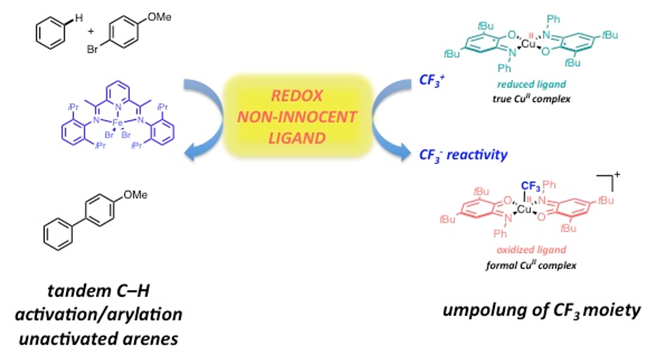 Non-Innocent Ligands : New Opportunities in Iron Catalysis, Blanchard, S. ; Derat, E. ; Desage-El Murr, M. ; Fensterbank, L. ; Malacria, M. ; Mouriès- Mansuy, V. Eur. J. Inorg. Chem. 2012, 376–389. Increasing concerns regarding cost and sustainability-related issues of noble metals are driving chemists to revisit the chemistry of their neglected cousins : late first-row transition metals, among which iron. The electronic configuration of this metal makes it prone to mono-electronic transfers, which limits its use in true broad-scope synthetic methodologies. 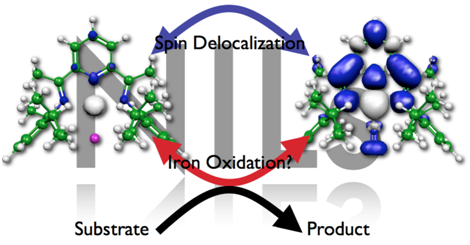 The versatile nature of non-innocent ligands (NILs) broadens the synthetic scope of iron catalysis. The ability of NILs to act as a storage/supply unit of electrons allows to promote bis- over mono-electronic transfers, allowing iron catalysts to perform reactions that were previously restricted to noble-metals based catalysts. Tandem C–H activation/arylation catalyzed by low-valent iron complexes bearing bisiminopyridine ligands, Salanouve, E. ; Bouzemame, G. ; Blanchard, S. ; Derat, E. ; Desage-El Murr, M. ; Fensterbank, L., Chem. Eur. J. 2014, 20, 4754–4761. A low-valent iron complex bearing non-innocent bisiminopyridine ligands performs tandem C–H activation/arylation between unactivated arenes and aryl halides. Similar reactions catalyzed by first-row transition metals have been shown to involve substrate-based aryl radicals while our catalytic system likely involves ligand-centered radicals. Preliminary mechanistic investigations based on spectroscopic and reactivity studies in conjunction with DFT calculations lead us to propose that the reaction could proceed through an inner sphere C–H activation pathway, which is rarely observed in the case of iron complexes. This bielectronic noble metal-like behavior could be sustained by the redox-active non-innocent bisiminopyridine ligands. Iminosemiquinone radical ligands enable access to a well-defined redox-active CuII–CF3 complex, Jacquet, J. ; Salanouve, E. ; Orio, M. ; Vezin, H. ; Blanchard, S. ; Derat, E. ; Desage-El Murr, M. ; Fensterbank, L., Chem. Commun. 2014, 50, 10394–10397. Reaction of a copper complex bearing iminosemiquinone ligands with a CF3 + source provides an unprecedented CuII–CF3 complex through ligand-based oxidation. Reactivity of this complex leads to nucleophilic trifluoromethylation of the ligand, suggesting an electronic interplay that results in a formal umpolung of the initial CF3 +.